That about sums up my week last week. It’s been awhile since I’ve posted about the need we all have from time to time to DOWNSIZE. I went through two major events in my life where I had to take a good, hard look at the reasons I wasn’t saying “No” instead of “yes” all the time. In the time since, I noticed that I have been more aware, cautious, and able to manage stressful situations in my life ever since such events. All of a sudden, every single day, while not any life-altering, horrible tragedies occurred, I kept making mistakes and reflexive judgments that I was wrong about every time I made them. Duh. That’s what happens when you make such judgments. Suddenly a whiff of my past swirled around me. Ah yes. At that moment, standing in the cold in a parking lot in downtown Hartford, I had the sudden realization that I had been here before. The times when I rushed along, saying yes to everything, piling up my plate (I wrote that specifically for a friend who hates that phrase) with things I thought I SHOULD do, that’s when small catastrophes occurred. It’s not rocket science. Too much frivolity = burnout. Last week was a minor burnout. Say you’re driving down the highway at a reasonable speed and suddenly! A deer jumps out from the woods and into your lane and you JUST miss it. You may pull over, or just tap the brake or just keep going, but you will probably pause for a moment and ask yourself, “Where was I just then?” That’s minor. That’s not a major burnout meltdown where you hit the deer, go careening off the road and into a ditch. Ya know? So, now’s the time dear friends, for me to do a spring de-cluttering and kick out all the old stories, cobwebs and “should-dos” from my life to leave room for the awesome, much more expansive, glittery shiny new goodness to enter my life. Why DO we all pile on so much unfulfilling garbage? Why do we keep telling ourselves the same stories and excuses that don’t yield us results anymore? I’m not sure, but to me, the idea of clearing out so much is scary because we just don’t KNOW what can happen. Yesterday I had a synchronous conversation with someone whom I have been friends with for 12 years. He and I talked about how when you’re young you think it will take forever to get to your dreams. And ya know, sometimes that’s true. But you have to be ready every step of the way as you learn and build your dream, to say YES to the opportunities that will get you there. Otherwise, you’ll just keep saying yes to the garbage and never climb the ladder to your dream. And then wonder WTF is going on. Sure it’s scary to go in a whole new direction. But isn’t it worse to stay in a constant state of mediocrity, watching yourself slowly deteriorate, just..blah? Like a bag of stale chips? 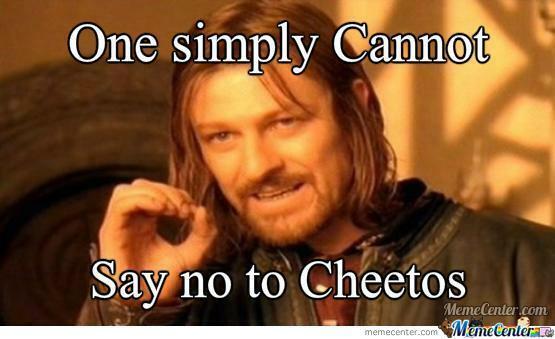 Or worse..Cheetos? So, here we go. It’s time for me to be honest about a few choices I’ve been making in regards to my career and overall life, and just let go of the things that aren’t doing me any good anymore. The funny thing is, we are conditioned to believe that the things that cause us the most pain are the things that are best for us. SO. Not true. Sure there are the things we HAVE to do like pay taxes, go to the dentist (I actually enjoy this, I know, I’m a weirdo), have difficult conversations, lose people we love, but you KNOW what I mean. I’m signing off to go make my spicy vegan pesto whole wheat pasta with roasted petite potatoes, mushrooms and red kale. Unrelated but it DOES make me happy. That and the organic Chardonnay I purchased. March is just not a good month for me. I’m not superstitious, but color me Irish when it comes to the Ides of March. This is the third time I’ve had some sort of accident in March. This time it was THE LAST DAY OF MARCH. It’s almost like a pre-April Fool’s Day joke. Ok. McDougal out. This was a collaborative, incredibly exciting film shoot. I directed the episode and with the help of my crew and cast, we were able to shoot two distinct scenes in exactly 2 takes. Obviously there were multiple takes, but the end results are essentially two separate takes. I hope that through the movement, design, and acting, our “Holding” followers fully enjoy this episode! Today I have already received great feedback about the editing, as well as some feedback that one person thinks it’s the funniest one yet! To me, the greatest experience of this was the journey with my freaking amazing, flexible and MULTI-talented crew and cast. It’s just the cherry on the top to share it with all of you.